I’ve been using a Sublimox sublimator (vaporiser) since late 2014. In that time it’s worked faultlessly. There have been only two things that have needed any attention. These are the screws that hold the heat shield in place and replacement of the ‘O’ rings on the nylon cup you load with oxalic acid. Actually, the other thing that needed attention was the heating chamber that became coated with caramelised glucose when I first used Api-Bioxal … but I’ve posted on that separately. 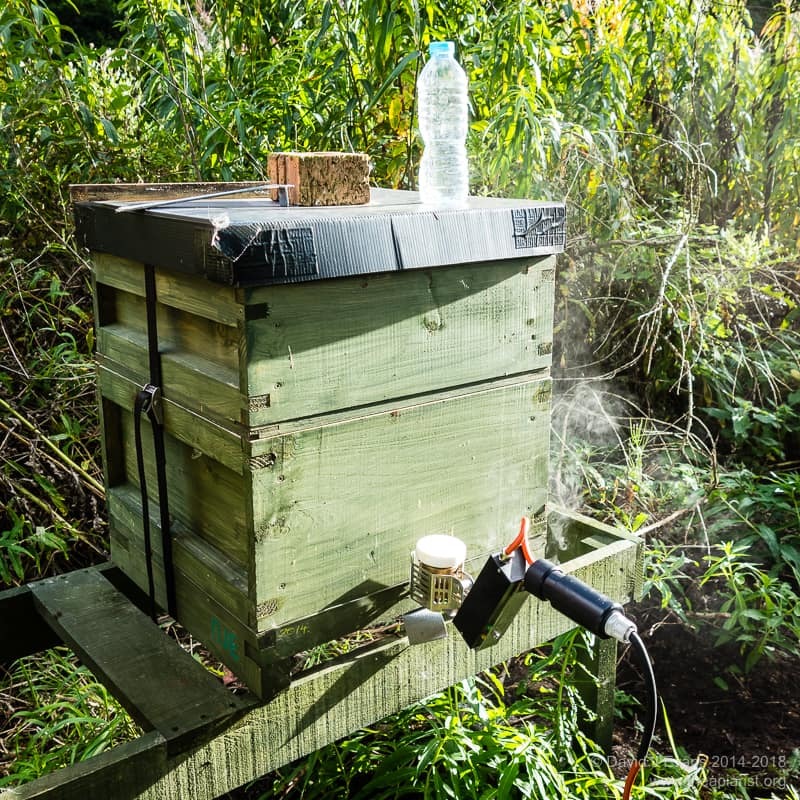 The heat shield protects the operator and your easy-to-melt poly hives from the metal heating chamber within which the oxalic acid is vaporised. It’s made out of folded, perforated metal and is held in place with two small retaining screws on the underside. The heat shield can get a bit of a battering. The sublimator rests on it when the machine is laying on the side. More significantly it can get twisted or pulled if it gets caught on the edge of the hive when inverting it to deliver the oxalic acid. Inevitably, it is also subjected to repeated cycles of heating and cooling. All of this tends to mean that the grub screws work loose over time. If the machine is cool they can be finger-tightened, but they’ll eventually loosen off again. To rectify this and prevent their permanent loss in the apiary mud I gave them each a dab of Loctite 243 and tightened them up properly 1. This appears to have done the trick and they’ve remained in place without loosening. The nylon cup you preload with oxalic acid has an O ring seated in a groove. This provides a gas-tight seal with the metal chamber in which the OA is vaporised. It’s a tough life being an O ring. It is subjected to a very harsh environment consisting of both high acidity and high temperatures. With repeated use the O rings become less able to form the gas-tight seal. They get thinner, crack and/or stiffen. Eventually they fail completely. Once they have failed there’s a significant risk of vaporised oxalic acid escaping. Aside from potentially increasing operator exposure this also means that all that mite-destroying goodness is not being delivered where it does most harm (to the mites in the hive). Replacement O rings can be purchased from the various suppliers of the Sublimox. Icko used to list them on their website but they appear to have disappeared for the moment. Abelo list them at £2 each. As an alternative I’ve purchased and am testing some Viton O rings from eBay. Viton 75 is a “DuPont-manufactured fluorocarbon elastomer that exhibit excellent resistance to high temperature and many organic solvents and chemicals over a temperature range of -25°F to +400°F”. Which sounds ideal for something that needs to work with oxalic acid at a temperature of about 160°C. The documentation from Dupont indicates that Viton has excellent resistance to oxalic acid. I’ll post on how well these work sometime in the future. Although not really a “spare or repair” it’s worth noting here that the Sublimox requires a 240V supply and so should always be used with an RCD (residual current device). 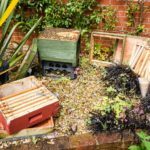 This is particularly important since the apiary in winter is probably a damp (or worse) environment. An RCD, together with a bottle of water for cleaning the vaporiser, can just about be squeezed into the carry case. 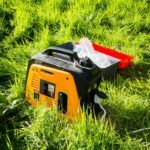 It’s therefore available whether you use a portable generator or an extension lead to the mains voltage supply. As the season slowly starts, colonies will begin rearing more brood. You don’t need to open the colony up to determine this. Instead, insert a Varroa tray under the open mesh floor and look for thin rows of “biscuit crumbs” that are the cappings from emerging brood. And, while you’re looking at this evidence that the long winter will soon be over, look carefully for any Varroa that have dropped from the colony. 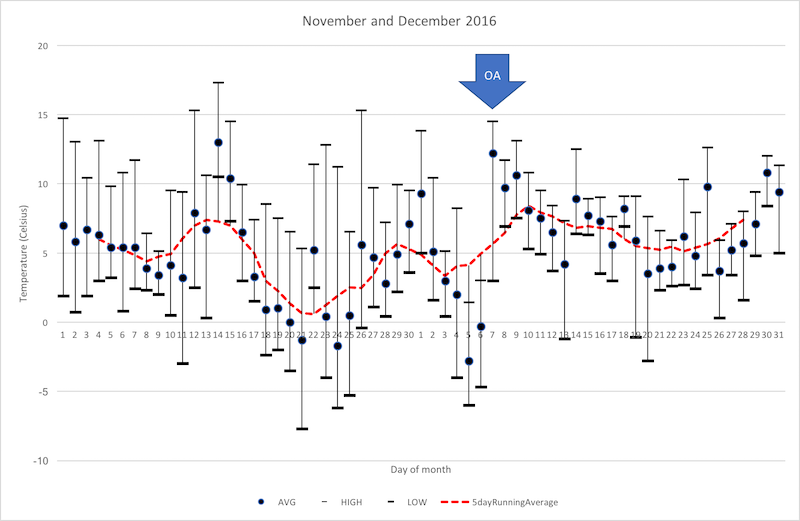 Mite drops should be very low if your autumn and midwinter treatment regime was effective. 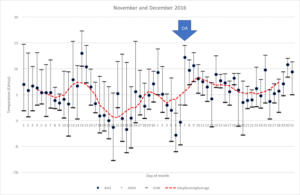 You need to monitor for at least a week. 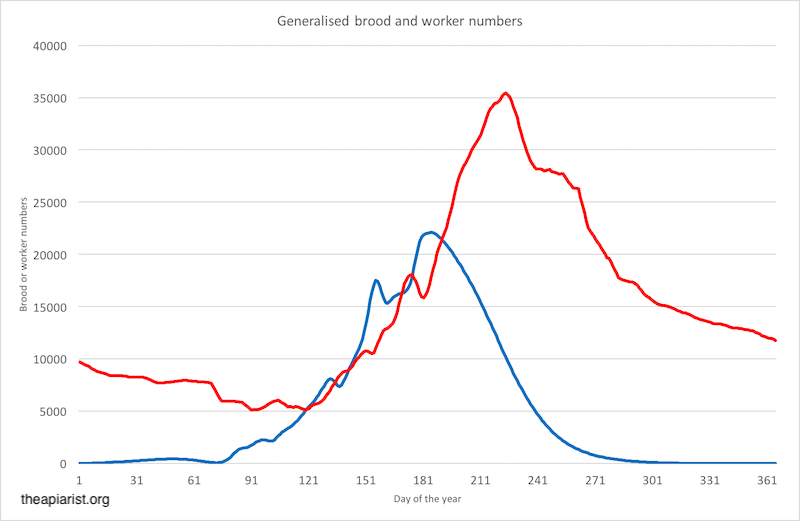 With low mite numbers in the colony and small amounts of sealed brood the drop can fluctuate a bit. If the mite drop is not low or non-existent there’s probably no need to treat immediately 2. 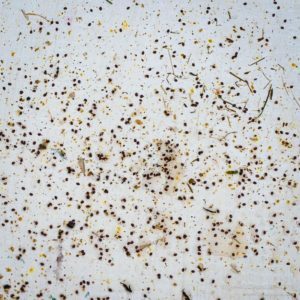 However, make a note to monitor the colony at regular intervals – both for mites and overt DWV disease – and intervene if necessary. 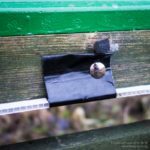 This entry was posted in Beekeeping, Sublimators, Varroa and tagged Loctite, sublimation, sublimox on February 23, 2018 by David. … they’d make the Sublimox sublimator. I wonder how many beekeepers have one of these on their wish list for Santa? From being a bit of an imported oddity (I had to import mine from Icko Apiculture in France three years ago) they’re now becoming mainstream … over the last year or so they’ve been sold by an independent importer, then Abelo and – just this month – the ‘Big Daddy’ of UK beekeeping suppliers, E. M. Thorne (Rebecca at Thorne’s kindly asked if they could include links in their December newsletter to previous posts here on the Sublimox and vaporising Api-Bioxal). The Sublimox is also now being discussed more widely on the online forums, with much of this discussion emphasising the price (they are expensive). Aside from this disadvantage, I think there are a number of significant advantages of this design of sublimator (vaporiser) which are worth emphasising. Sublimators (vaporisers) are designed to heat oxalic acid (OA) crystals sufficiently that they sublimate i.e. go through a phase transition from a solid into a gas without an intervening liquid phase. As readers of this site should know, oxalic acid is highly effective against the Varroa mite – both by sublimation and trickling in solution, which has recently been covered in excruciating detail so won’t be elaborated on here. Many sublimators (vaporisers) are passive. You add the OA to a pan, slide it into the hive entrance, apply a current to heat the pan, allow the OA to sublimate, withdraw the pan and start again. You usually need to cool the pan in water before addition of the next dose. This heat, rinse and repeat cycle takes time, but is very effective and the pan-type vaporisers are relatively inexpensive (£35-£100). The Varrox vaporiser is one of the original and best known models, though there are any number of much less expensive copies sold by beekeeping suppliers and on eBay. Most require a 12V supply of some kind. In contrast to these, the Sublimox is ‘active’, as is the US equivalent machine, the ProVap 110. In these the pan is pre-heated, the OA is ‘dropped’ into the pan in such a way that the vapour is generated in an enclosed space which it then escapes under pressure through a nozzle. In terms of speed, convenience and ease of use I’d argue that the Sublimox is hard to beat. 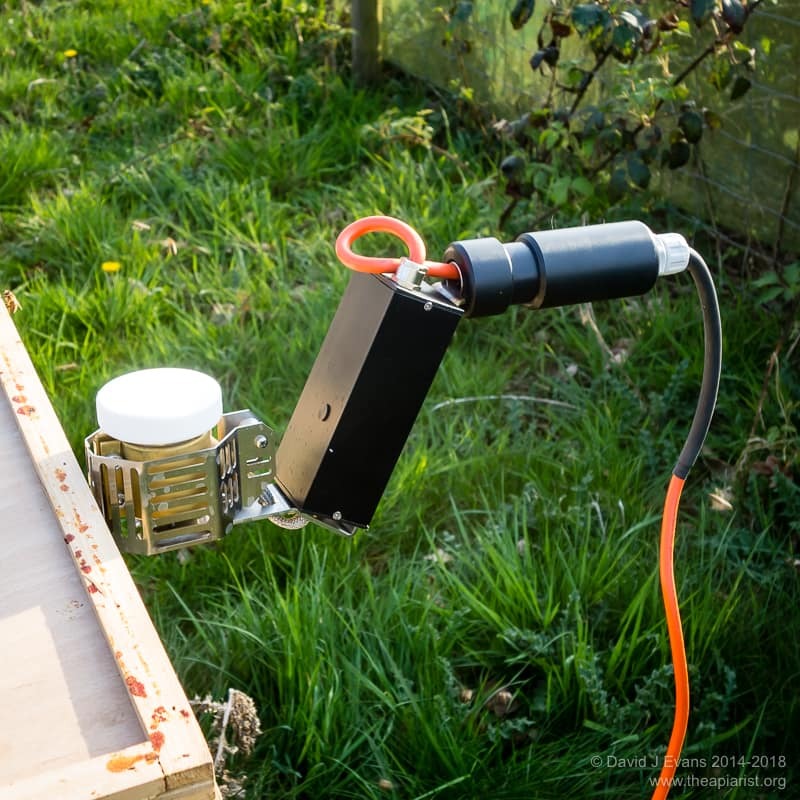 Delivery of a single dose takes no more than 45 seconds from inserting the Sublimox nozzle into the hive. 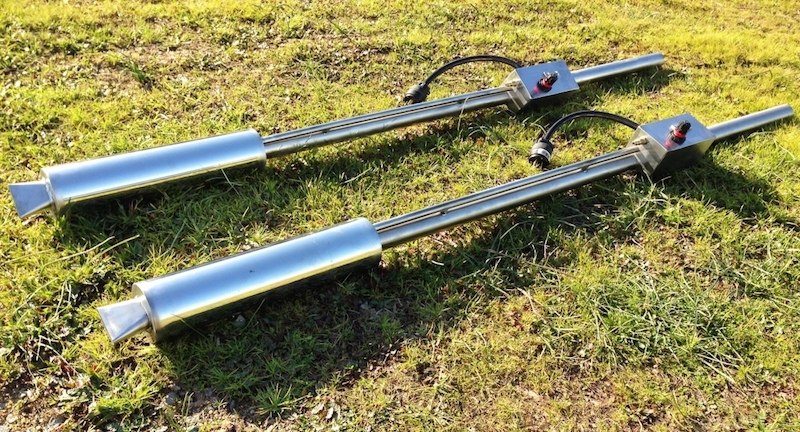 It’s appreciably faster than the pan-type passive sublimators. There’s a preliminary warming up period before use, as the machine reaches operating temperature. After that it’s simply treat, refill, treat, refill ad infinitum. 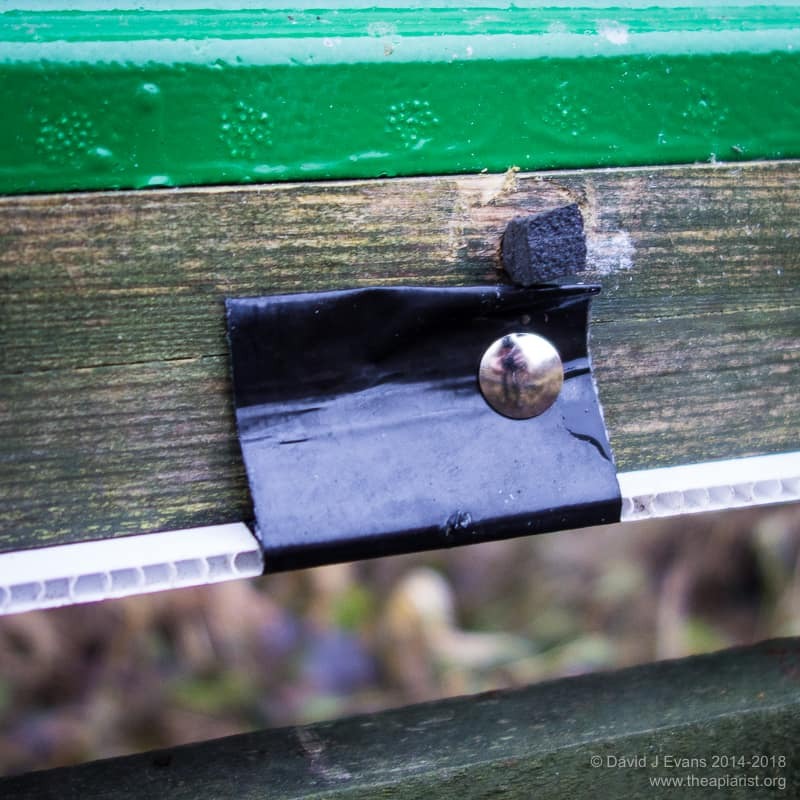 The rate-limiting step is sealing the hive and refilling the small plastic ‘cartridge’ with OA. 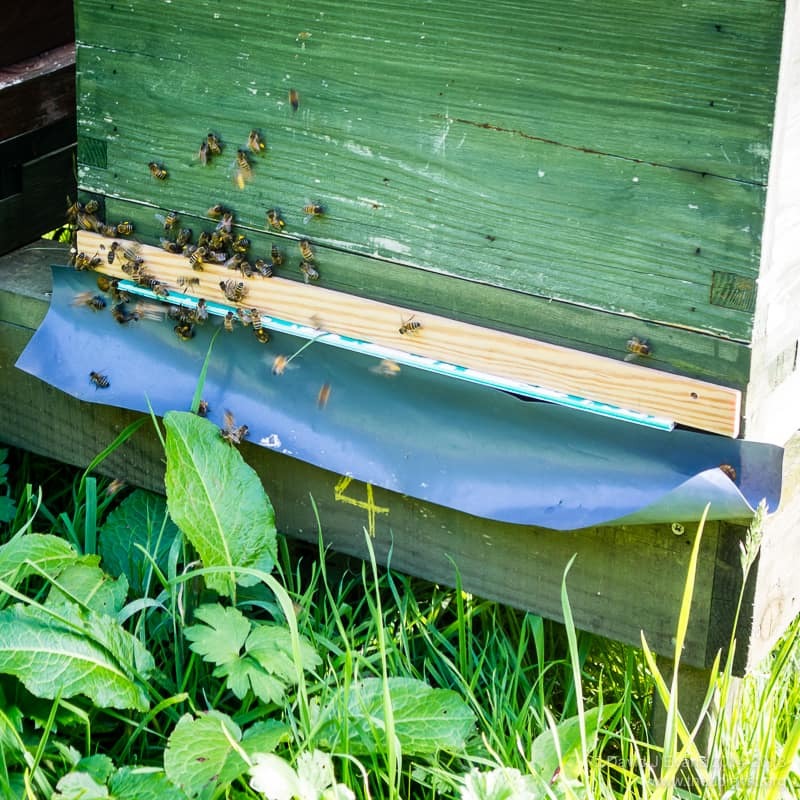 For one person, a hive-a-minute is just about possible – if you have 10-20 closely spaced hives, sufficient entrance blocks and buy additional white plastic cartridges. But, to achieve this you’ll be rushing about like a mad thing and it’s not realistically achievable1. But speed isn’t the major benefit. It’s convenient because you can ‘squirt’ the gas through a small hole in hive. You don’t need to open the hive and so it works with any hive type or entrance. My favoured kewl floors cannot be used with a sublimator that needs to be pushed through the entrance. 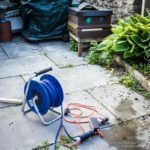 Instead, all my hives have a neat 6mm hole drilled through the sidewall of the floor which is usually plugged with a small foam bung or twist of grass2. Vapour quickly permeates throughout the hive, ensuring all surfaces are reached. The only exception are the all-poly hives, such as the garishly coloured Abelo’s I’ve been using for work this season. The nozzle of the Sublimox gets hot and melts polystyrene (been there, done that 🙁 ). With poly hives I usually use a simple shallow eke with a Sublimox nozzle-sized hole in one side. 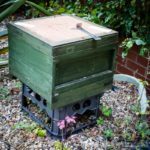 In this case you do need to remove the roof and crownboard, add the eke, replace the roof (upside down), treat and then close up the hive. The alternative is to simply squirt the gas through the open entrance. This isn’t ideal as some of the gas will escape, potentially exposing the beekeeper and definitely not exposing the bees/mites. 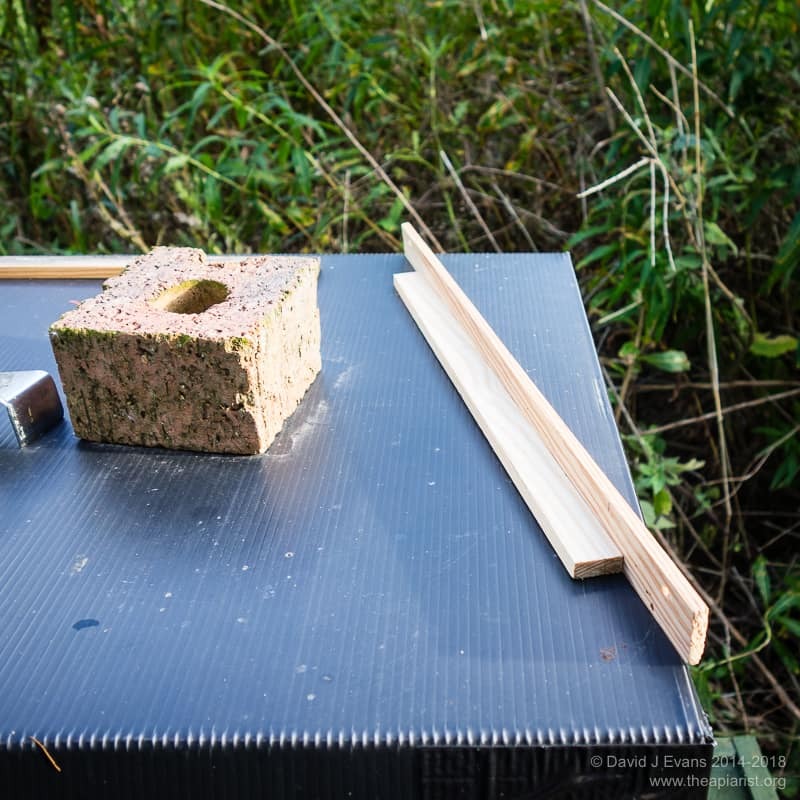 One way to avoid this loss of gas is to use a wooden block with a small hole through the middle held over the poly hive entrance. It’s important to have a clear space into which the gas is ‘squirted’. If you don’t the OA tends to not permeate through the hive properly. The Abelo hives have a hole in one face of the brood box. This is usually plugged. I think it’s intended as an upper entrance. I’ve yet to try poking the Sublimox nozzle through this hole to deliver the OA … this might not work as it may be too close to the frame, so impeding the spread of gas through the box. Time will tell†. There’s an additional benefit of the way the Sublimox is used. 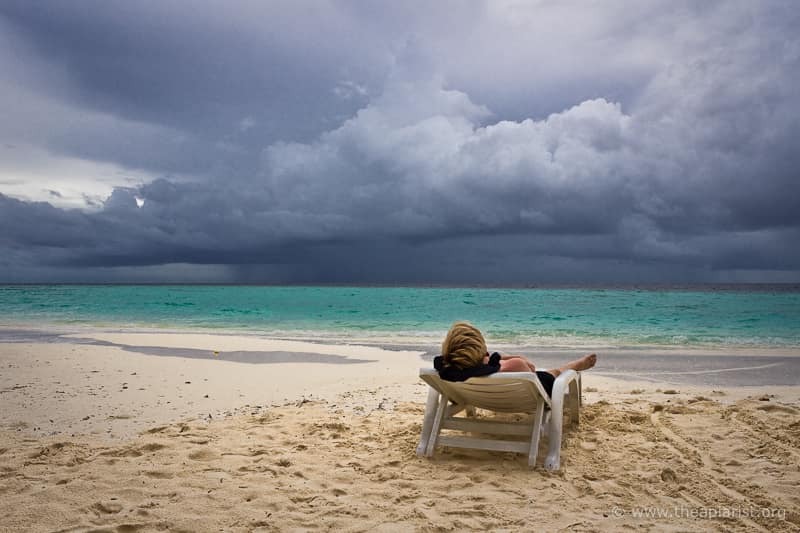 Operator exposure to OA should be minimised. The gas isn’t generated until the machine is inserted and inverted and takes no more than ~45s to deliver. If the hive is sealed properly there’s very little exposure to the gas. The Sublimox is three-times the price of a Varrox vaporiser. Is it worth it? 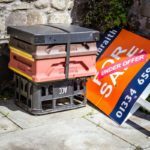 That’s up to the purchaser to decide, based on the number of hives to be treated, the depth of their pockets, the perceived benefits of the speed, ease of use, convenience and safety etc. Many will baulk at the cost. Some build their own. Others don’t bother vaporising, but solely dribble OA solution in midwinter. This is the cheapest and fastest way to treat colonies. I estimate it costs about 0.5p/hive to trickle treat if you buy OA in 25kg bags. Dribbling is probably even faster than using the Sublimox. 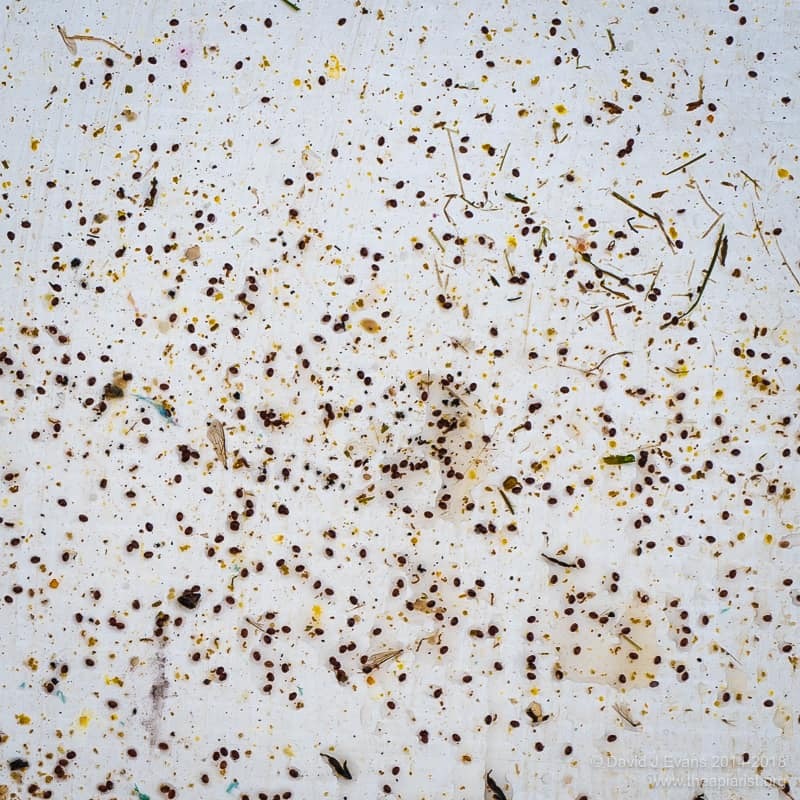 However, dribbling is really only practical for broodless colonies – swarms and for midwinter use – and should only be done once per season. In contrast, repeated sublimation is tolerated well by colonies. Be aware … the Sublimox requires a 240V supply. 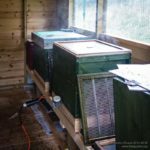 One of my apiaries has mains power which is the best solution, but unlikely in the corner of a farmers field. You can use an inverter from a car battery which is fine if you can get your car close enough to the hives. 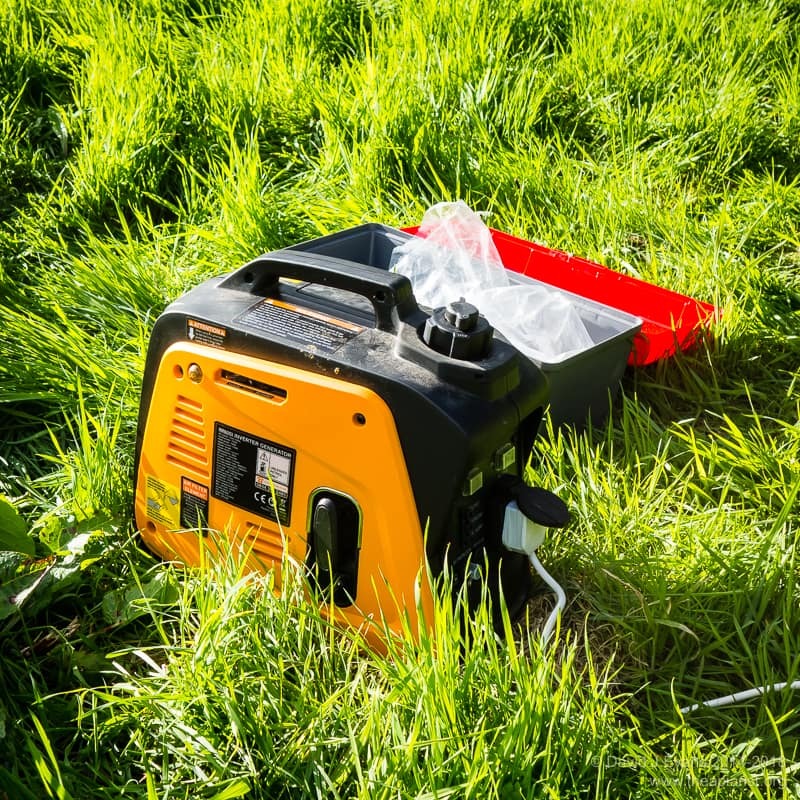 Alternatively – and this is what I do – you can use a portable generator. I’ve got an 700W Impax one from Screwfix which works perfectly. 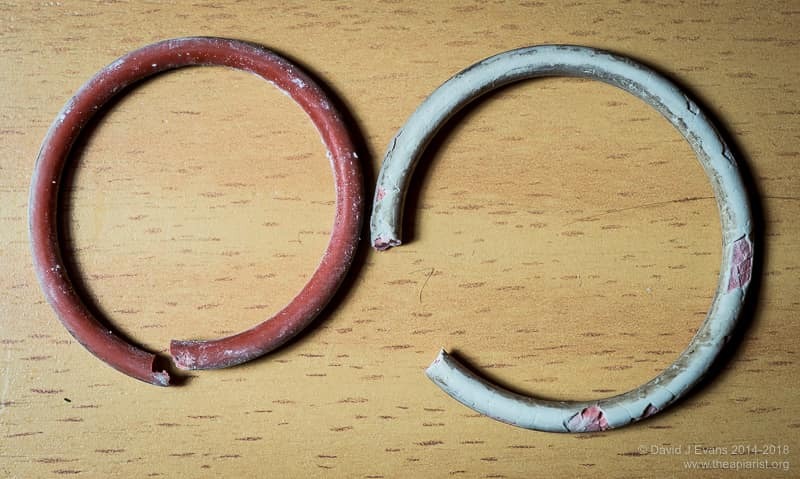 You’ll also need to periodically buy replacement sealing rings for the OA “cassette”. These wear out or perish rather fast. Icko sell them for a daft price, but they’re now available in the UK. 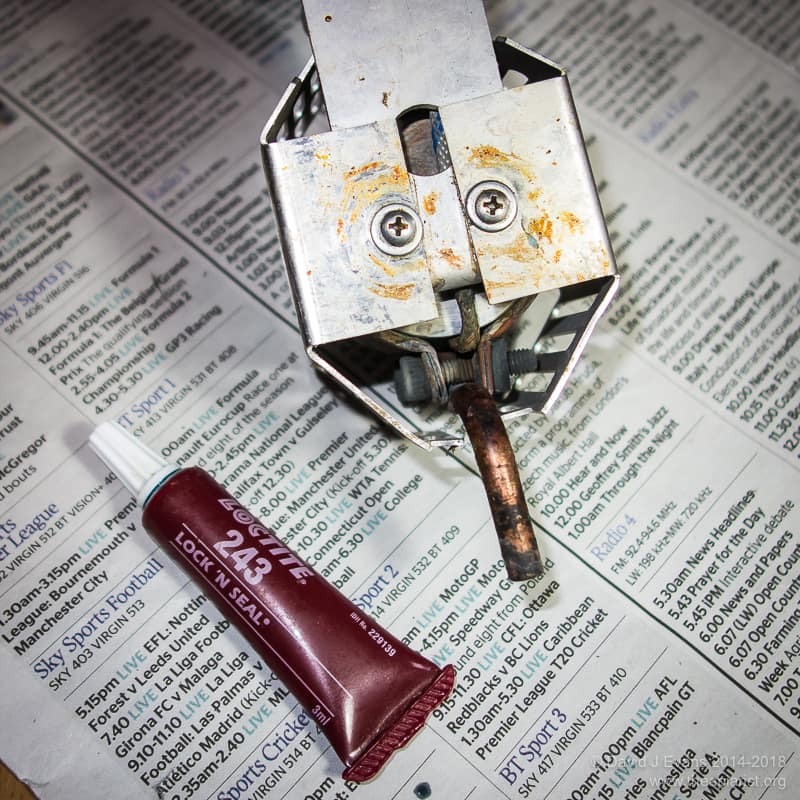 You should also be aware that Api-Bioxal, the VMD-approved oxalic acid-containing miticide, has glucose in it which caramelises in the pan of the Sublimox (and other vaporisers) and is a bit of a nightmare to clean out properly. I’d go further and suggest that Api-Bioxal is unsuitable to use with a Sublimox. If the nozzle is blocked the gas has to escape and there could be inadvertent exposure of the operator. I’ve touched on safety above. However, just because OA vapour is generated for a very short and well defined time doesn’t make it safe. There are still exposure risks which must be taken seriously. You’ll need PPE – personal protection equipment – to prevent exposure to the OA vapour when treating colonies. This includes eye protection and a suitable vapour mask. Don’t skimp on this and assume you’ll just stand downwind. If the hive is poorly sealed, swirling gusts of wind will expose you to vapour and it’s – at best – very, very unpleasant. Unlike passive vaporisers, the Sublimox generates a very large volume of gas immediately the OA is added. There’s no opportunity to ‘stand well back’ as the pan warms up as you can with the passive machines. You have to be holding the Sublimox to invert it and drop the OA into the pan. You’ll be bent over the hive and unable to avoid the swirling fog of acidic vapour if it escapes. To help minimise this seal the hive thoroughly. 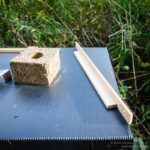 I use a full-width entrance block and tightly fitting Varroa tray. Even then, particularly on ageing cedar hives, there are all sorts of little gaps from which the OA vapour can be seen escaping. 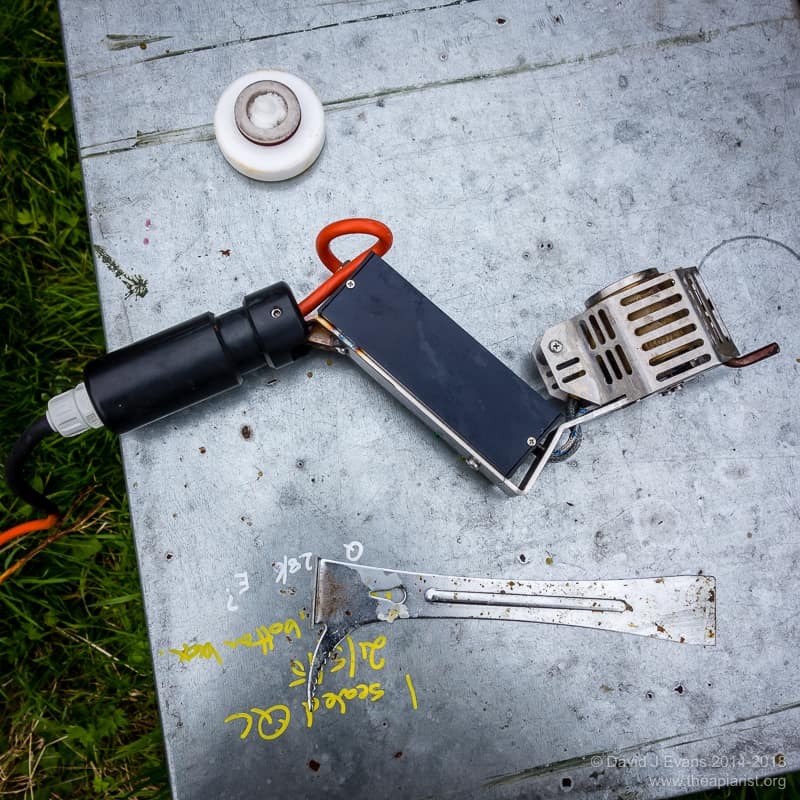 Finally, as if gassing yourself with an evil smelling acidic cloud of OA wasn’t enough, remember you’re using a 240V supply outside, probably on damp grass … or possibly even in the rain. Don’t get electrocuted. Make sure you use an RCD (residual current device) that’s been tested and you know works. At the time of writing the Sublimox costs over £300. Perhaps competition will force the price down a bit? When you consider that these machines are used relatively infrequently during the season it makes sense to consider purchasing them as an Association item (or with a group of friends), in the same way that some associations have extraction equipment available. When compared to a reasonable extractor the Sublimox doesn’t seem so outrageously priced. 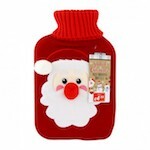 Of course, like an extractor, everyone needs it at about the same time of the season (at least in midwinter). However, unlike an extractor, it’s generally needed for a relatively short period, is easy to transport and easy clean after use. There should be no reason it couldn’t be shared by association members. I appreciate that many associations don’t have shared equipment, or many beekeepers don’t belong to their local association. All I’m doing is suggesting a way in which a good quality and highly effective piece of equipment could be purchased so that many can benefit. 1 The rate-limiting step is probably having enough entrance blocks. If removed too soon you’ll lose lots of vaporised OA goodness. Leave it a good 5 minutes if at all possible, which is easily enough time to treat another 5 hives. See what I mean? 2 When treating a hive for the first time I’ve even drilled this hole through an occupied hive. † Actually, this hole isn’t suitable. It opens onto the face (rather than end) of a frame, and the vapour is therefore restricting from spreading. Don’t bother. ‡ I’ve regularly treated colonies in the dark. Sometimes the only time I can get to the apiary is after work. 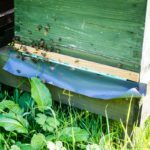 The bees are all ‘at home’ but you can easily seal the hive up and treat them. Use a headtorch with a red bulb. Since bees can’t see red, any that escape won’t directly target your head and you can probably work safely without a veil. 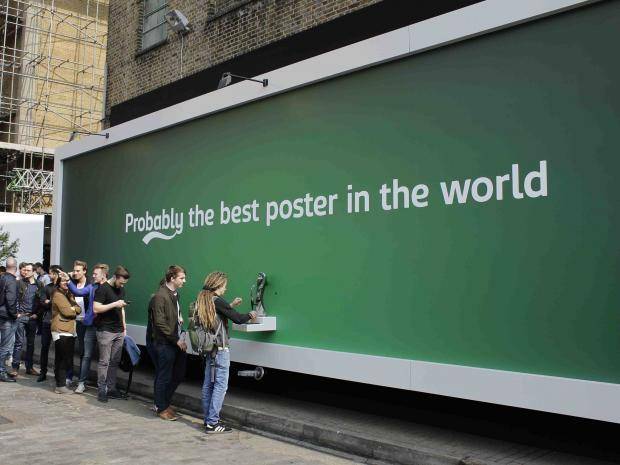 If Carlsberg did … is one of the most recognisable advertising campaigns of all time. Originally created in 1973 it has achieved near-universal recognition and remains in daily use, though predominantly these days as internet memes. The opening three words of the adverts were as recognisable as the closing seven … probably the best lager in the world. There are any number of comedic If Carlsberg did ‘advertising’ campaigns, including some from Carlsberg itself … Probably the best poster in the world, featured the distinctive swirly underscore, colour scheme and font, together with a real tap dispensing lager installed in Londons Brick Lane. Carlsberg revamped the advertising campaign in 2015 (the poster above was part of this), over 40 years after it was first used. You can view these adverts on the Carlsberg website. I’ve used a variant of the If Carlsberg did … phrase previously, when describing the large Dadant smoker. It’s still a great smoker. This entry was posted in Beekeeping, Sublimators and tagged Api-Bioxal, oxalic acid, sublimation, sublimox, vaporiser, Varroa on December 22, 2017 by David. 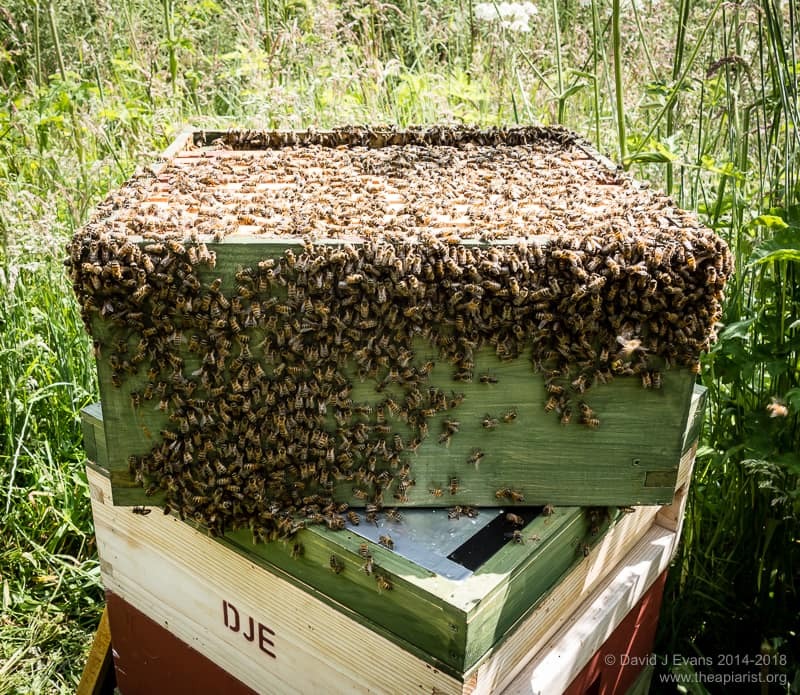 Anyone reading the beekeepingforum.co.uk will be aware that there are a number of contributors there that enthusiastically recommend the treatment of colonies with vaporised (or, perhaps more accurately, sublimated) oxalic acid to reduce Varroa levels. There are almost as many homegrown or imported vaporisers as there are treatment regimes to hammer down the mite levels. Of course, there’s the contentious point that oxalic acid is not approved by the VMD (Veterinary Medicines Directorate), despite having been in routine use for decades. Api-Bioxal is, but is probably unsuitable for sublimation due to the inert (as far as Varroa are concerned) additives it contains. 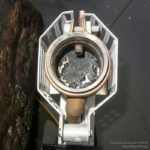 Api-Bioxal can be vaporised but leaves a caramelised residue in the vaporiser pan that is hard to clean. ‘Vaping’ is also popular in the US. Randy Oliver has covered it extensively on his scientificbeekeeping.com site and it’s also regularly discussed on Beesource. OxaVap make/supply a vaporiser that appears very similar to the Sublimox I use. The OxaVap model has a useful temperature display that I would find much easier to read than the red/green diodes on the Sublimox … I’m red/green colourblind. 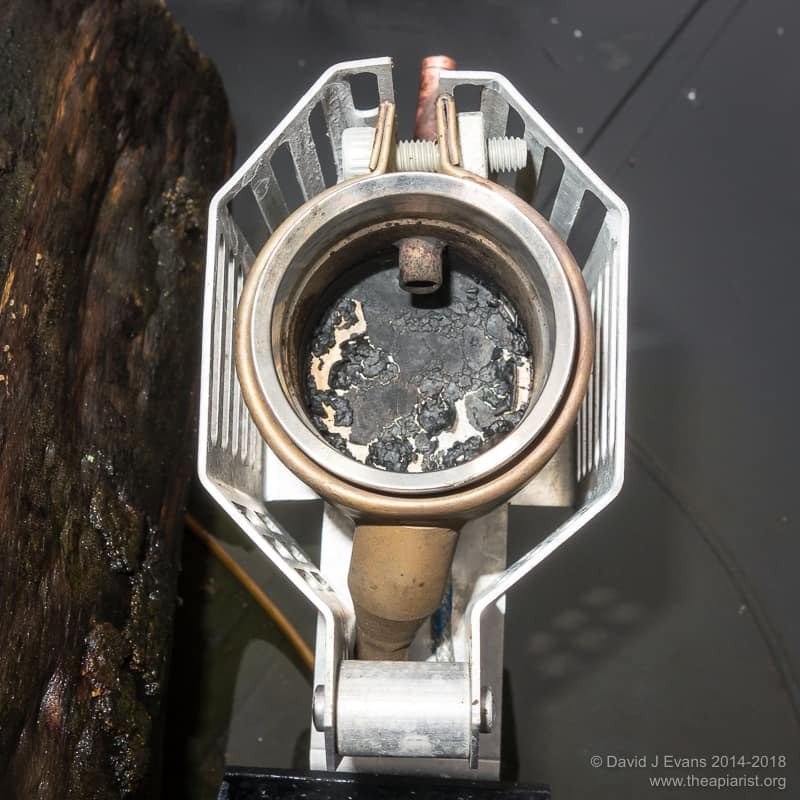 The Sublimox and OxaVap vaporisers are ‘active’ … they blow out a dense cloud of OA-containing vapour through a relatively narrow diameter nozzle (the video below uses water to demonstrate this process). This provides advantages both in terms of ease and speed of delivery. These vaporisers simply need a 7mm hole drilled through the sidewall of the floor (see photo at the top of the page), or through an eke placed over the colony. The OA-containing vapour is ‘squirted’ in, permeates all corners of the hive within seconds and you can then move on to the next hive. The vaporiser doesn’t need cooling between treatments and the dose administered is tightly controlled. However, OA dosage isn’t critical. It has been shown to be well-tolerated by bees in studies from groups in the UK and Germany. If the dose isn’t critical and speed really is important then perhaps consider the vmVaporizer. At $3600 it’s about ten times the price of a Sublimox. The manufacturers claim you can treat 300 hives an hour with one of these … one every 12 seconds. For comparison, the Sublimox takes 20-30 seconds per hive. However, what takes the time is sealing the hive, moving the generator about, unsealing the hive etc. so you’d need a team of (well protected) helpers and some closely spaced hives to achieve a similar rate. The vmVaporizer is mains (110V) powered so would also need a generator or inverter. The video above demonstrates the vmVaporizer in action. It produces copious amounts of oxalic acid vapour, albeit less ‘forcefully’ than the Sublimox. It seems the only way to control how much is delivered is by changing the duration the hive is exposed for. 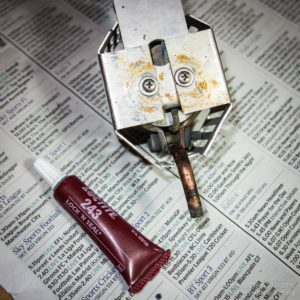 Undoubtedly this is overkill for the majority of readers of this site, but it’s interesting to see what the commercial beekeeping community are using (much like browsing the decapping or bottling machines in the Swienty catalogue). There’s at least one satisfied UK-based beekeeper quoted on the vmVaporizer site so … Mark, if you happen to read this I’d be interested in how well the machine works and whether you can achieve the quoted hive treatment every 12 seconds? And, does it work with Api-Bioxal? 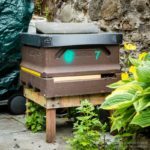 This entry was posted in Beekeeping, Sublimators, Varroa control and tagged Api-Bioxal, humungous, mites, oxalic acid, Shirley Crabtree, sublimation, sublimox, Varroa, vmVaporizer on August 4, 2017 by David. 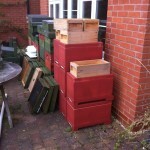 I’m moving house in a couple of weeks and so stacked unused ‘bee equipment’ in a pile on the patio for packing. Some of the supers contained drawn comb from previous years, some of the broods were empty and some contained prepared foundationless frames. I thought I’d taken care to align everything reasonably well to ensure they were ‘beetight‘ when I finished up late on Thursday evening. However, I’d misaligned a chest high stack in the middle and unknowingly left a finger-width crack which allowed some scouts to decide it was a desirable site. Sometime mid-morning on Friday – when I was in the office – a good sized swarm arrived. I hadn’t noticed any scouts checking out the location. I originally thought it was robbers cleaning out honey from the supers, but a quick peek under the roof (there was no crownboard on the stack) showed they were busy drawing comb. Going by the numbers of bees present it looked like a prime swarm, but you can’t be sure unless you find the laying queen. They couldn’t have chosen a much less suitable (for me … it obviously suited them 😉 ) stack to set up home in. The bottom three boxes were empty broods, topped with three supers, two of which were part filled with drawn drone foundation. Inevitably the spacing of the frames in the supers was all over the place. Removing the roof gently showed they were already building brace comb, attached to the roof and/or the frames. The bees were accessing the stack somewhere in the middle, on the face against the wall. What a mess. I fired up the smoker and got kitted up. It was relatively easy to split the stack and put a temporary floor below the supers (with the entrance facing the wall) and put a crownboard in place. The colony were agitated but not aggressive. There were far too many bees to try and find the queen. It was a hot day and there was a whirling maelstrom of bees. I was concerned that the queen – if she was mated – would start laying up the drawn drone foundation in the supers. By evening the stack was quietly humming away, with all the bees inside, so I moved them a few feet away to a purpose-built stand (the ubiquitous milk crate) … swarms can be relocated within 24-48 hours of arrival during which time the “3 foot, 3 mile rule” can be safely ignored. Early on Saturday morning I put a new floor and brood box filled with frames on the stand, then added a clearer board and put the two supers full of bees on top. 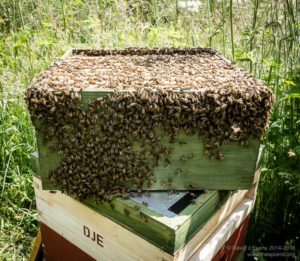 The hope was that many of the foragers would move down into the brood box, leaving the queen and attendants above the clearer. I peeked through the perspex crownboard on Sunday morning and the number of bees in the supers was much reduced. A quick inspection located a very dark unmarked laying queen in the supers. One wing was pretty tatty so she might be quite old. To my surprise the bees had re-engineered a big patch of the drawn drone comb in the super frame to make worker-sized cells and that was the area she’d laid up. 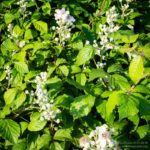 In addition, they’d also piled in a surprisingly large amount of nectar – presumably from blackberry which is just developing well at the moment. I rearranged the brood box, moving the queen on the laid-up super frame into the bottom box, then shook the remaining bees off the super frames and closed the colony up. Finally, late on Sunday evening I treated the colony by oxalic acid vaporisation. With no sealed brood in the hive it’s a perfect time to reduce the phoretic mite numbers by at least 95%. 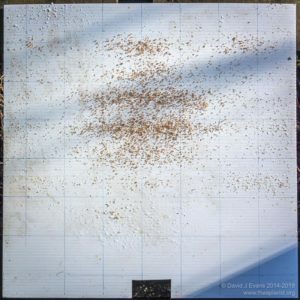 Since I have no idea about the provenance of the swarm – other than being sure its not from one of my colonies, all of which have marked and/or clipped queens – this gives at least some peace of mind that a range of unpleasant diseases aren’t being introduced to the apiary with the bees, or the mites they’re carrying. I’ll check the Varroa drop over the next few days and monitor the quality of sealed brood before deciding what to do with them. However, I suspect they’ll either be requeened or given away to an association member still wanting bees, or quite possibly both as I unite other colonies in preparation for moving. The faint sniffing is my hay fever … I’m not testing the OA vapour. The latter is a significant lung irritant and I’m wearing safety goggles and a mask for personal protection. I’ll post something separately on the Sublimox vaporiser later in the season. Note Unlike an earlier swarm only about ten mites dropped after OA vaporisation within the first 24 hours which is very reassuring. 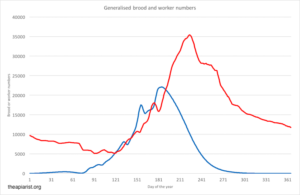 Some claim that only healthy colonies swarm and, although there is some truth in this (i.e. only strong healthy colonies build up sufficiently to swarm), it doesn’t mean the swarm won’t have a high phoretic mite load. Since, by definition, swarms are brood-free it’s an ideal time to treat them. 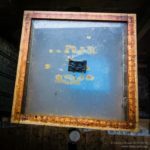 This entry was posted in Beekeeping, Swarms, Varroa control and tagged health, moving hives, oxalic acid, roof, sublimox, swarms, vaporiser on July 15, 2015 by David.